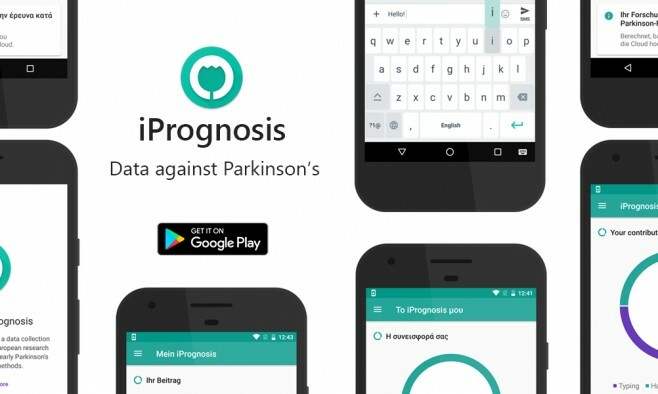 The i-PROGNOSIS research project captures the data of those who have signed up to its mobile app, using the information gained to try to improve the way Parkinson’s is managed by fostering new health practices based on the technology. Since its release in April 2017, 749 Europeans have downloaded the i-PROGNOSIS mobile app – available for free on the Google Play Store – and provided consent to participate in the GData collection study. Researchers hope the project will empower people with Parkinson’s, improve their quality of life as the disease progresses and reduce the need for hospitalisation. People over 40 can participate in the study, whether they have Parkinson’s or not. All data and information obtained through the i-PROGNOSIS mobile application is stored securely on the Microsoft Azure Cloud, while app users still own and control their data. The research study has been approved by ethical committees in all countries where the app is available – Germany, Greece, Portugal and the UK – allowing for large-scale data collection. The app logs a number of different user characteristics including voice data when the user is talking on the phone; timing and pressure data when the user types using the i-PROGNOSIS keyboard; location data periodically throughout the day; and facial expression data from front-facing camera photos. Watch the i-PROGNOSIS video below. The first evaluation of the i-PROGNOSIS mobile app yielded promising findings, with satisfactory results arising from both the technical and user acceptance evaluations. The purpose of the app was considered useful by participants in the study, who declared it easy to set up and use. Yet participants’ in some countries highlighted the importance of being kept informed about privacy protection and of raising awareness of the app among healthcare professionals, to ensure their inclusion in these novel processes for early Parkinson’s detection. i-PROGNOSIS said the coming year would be dedicated to the analysis of datasets collected through the app. Data collection will intensify with the release of the app in new countries and the development of an iOS version. A new research study – the SData study – will lead to further clinical evaluation of the i-PROGNOSIS app’s potential to detect early Parkinson’s symptoms, and extend data collection by including new data sources. The evaluation will involve the clinical assessment of a subset of i-PROGNOSIS users – both people living with Parkinson’s and those without the condition – by medical experts from the i-PROGNOSIS consortium. In addition, smartwatch devices will be given to a subset of users to provide additional data regarding hand tremor, sleep, movements linked to food intake and their relationship with the condition.